After dinner at Sushi Katsu, we went to Dezaato Pan for dessert. Dezaato Pan is a cafe that serves bread, coffee, gelato and the most aesthetically-pleasing cakes. It’s usually beside a Tempura Grill restaurant. Dezaato means dessert while Pan means bread in Japanese. I decided to go here because of the parfait but sadly, the Tomas Morato branch didn’t have it. 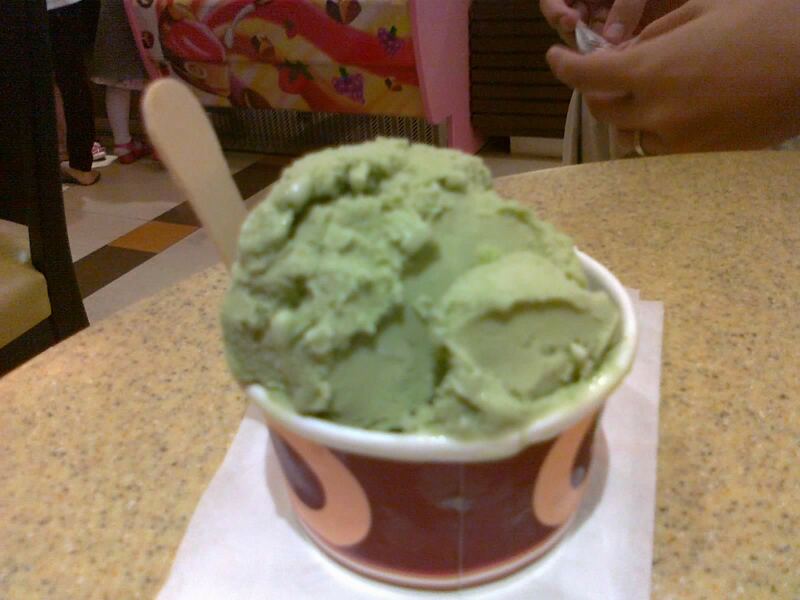 Instead, I got their Green tea gelato while Inggo got the French Vanilla gelato for (55php) each. There are other unique flavors which was priced a bit higher than what we’ve ordered. 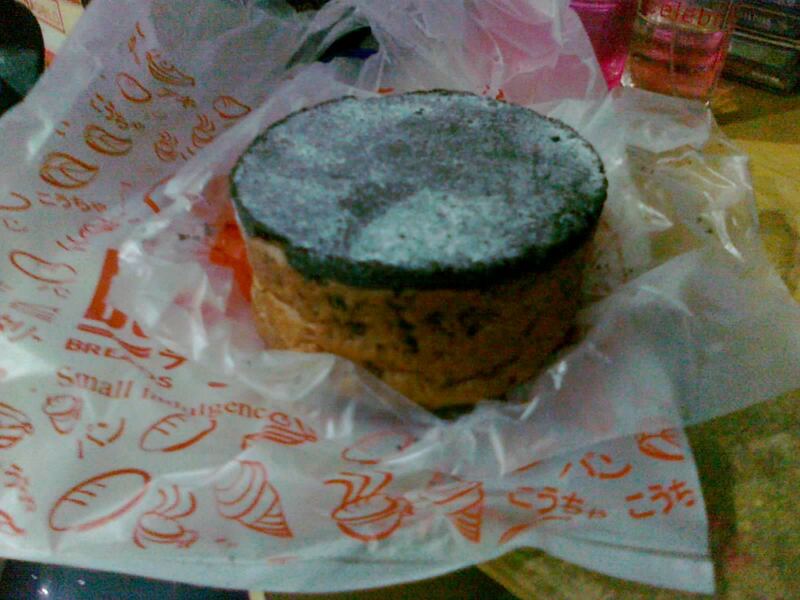 I also got the Choco Otaku bread for (50php) for takeout. The bread here is self-service similar to Bread Talk. Oh, and the bread gets a 30% discount if its past 7pm. The green tea gelato was served in a small cup. It was very creamy with a hint of green tea flavor. It wasn’t as bitter as green tea lovers would have wanted, it’s a bit sweeter. I liked this one. 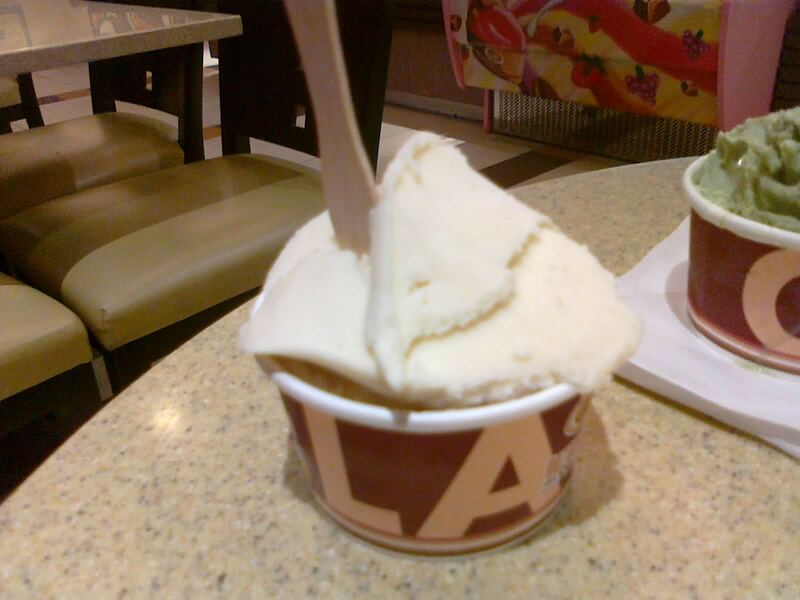 As for Inggo’s french vanilla gelato, he commented that it was creamy with the pure vanilla taste without the sugar. It was pretty good too. As for the Choco Otaku, I ate it at home. The top part was a hard chocolate crust with confectioner’s sugar. It was a delicious and bittersweet. The other part was a bit dry, but was okay for me. It has a chocolate filling that was very creamy and delicious. I loved the bread. They have a decent selection of coffee and tea to try out. Their cakes looks really good too. They have a decent bread selection to try but that depends on the availability. The gelato is priced okay for me, compared to the other shops with less quantity and priced higher. They’re also adding more stuff to their menu, adding all-day breakfast meals. Conclusion? I’d love to go back to try their other stuff. Recommended for: Dessert, Bread lovers. Smart nomnomnom tip: Buy your bread past 7pm to get the 30% discount.